Duraimurugan's son Kathir Anand is contesting from the Vellore Lok Sabha constituency. 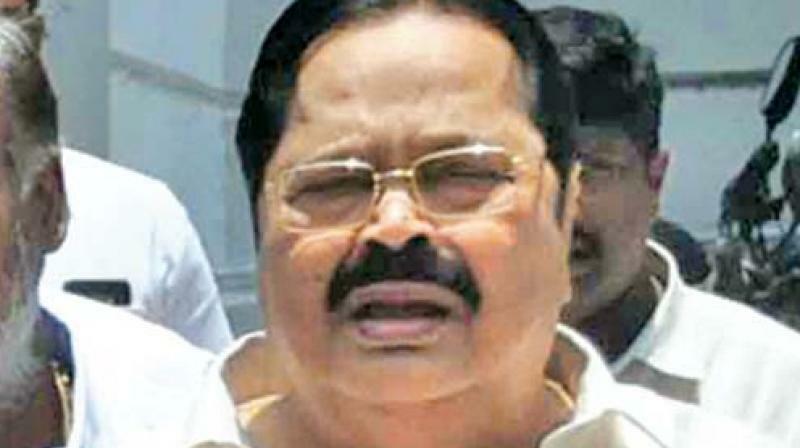 Chennai: Days after DMK treasurer Duraimurugan claimed no incriminating evidences were found during the I-T searches at his premise, the election commission has said about `10.57 crore unaccounted cash was seized during the raids at a cement godown, belonging to Duraimurugan's aid at Katpadi in Vellore Lok Sabha constituency and that the EC would file a case after obtaining magistrate's permission. Revealing the sum that has been recovered from homes of aides to DMK leader Duraimurugan, during the income tax searches, Chief Electoral Officer (CEO) Satyabrata Sahoo told reporters here on Tuesday that a case would be filed once the magistrate gives permission. A report based on the FIR would be sent to the Election Commission of India, he said and added that the poll panel would take a decision on the election in Vellore LS seat based on that report. During the recent raids, at his home, colleges run by Duraimurugan Educational Trust, and at a cement godown owned by his close associate Poonjolai Srinivasan, the I-T sleuths recovered `10.57 crore neatly packed in small bundles and stashed at a cement godown. The bundles were marked with ward and division numbers and meant to be distributed to voters, I-T department had said. Before swooping down on the godown, the investigating team had on March 30 conducted searches at the premises of Duraimurugan in Vellore district and seized `10.50 lakh of unaccounted money. Alleging the searches by the income tax department on the premises of his son were an attempt to malign the family's reputation, Duraimurugan on Sunday termed the raids as "undemocratic and a fascist measure." He also claimed the searches were an attempt to plant incriminating material on the premises of his family and later "recover" them as seizure to bring disrepute to him and family members and said the raids were meant to hinder the electoral prospects of his son.